You've found the “U.S. Belgian Blue Cattle Breeders” page here at Hobby Farm Wisdom! If this is the first time you have visited our site: Welcome! Belgian Blue is a breed of cattle that originated in Belgium. This breed goes by many different names, including Belgian Blue-White, Belgian White and Blue Pied. These are large sized cattle with very prominent muscle due to a condition called double muscling. This was specifically chosen with selective genetic breeding since it enhanced its ability to convert feed to lean muscle, creating beef with a lower fat content and increased tenderness. Once considered dual purpose cattle, today these animals are used primarily for beef production. Studies have shown that Belgian Blue beef is less marbled with more ribeye area than the average carcass. 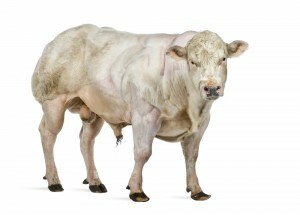 Belgian Blue cattle are quite large, with males averaging 1,700 pounds and females 1,100 pounds. Despite their size, they have a reputation as a very docile temperament. Accepted colors include white, blue roan and black.